Double row of 22 internees; 11 are seated in the front row. All seem to be wearing denim. All but two also seem to be wearing a white tie. Individual at far left seems to be the conductor. 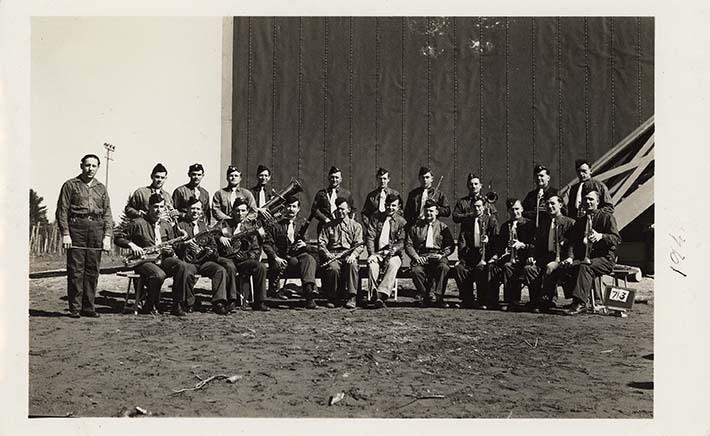 Most of the members of the band/orchestra are holding brass instruments including: trumpets, french horns, trombones, tuba, saxophone, clarinets, and flutes. The group is positioned in front of a building whose facing seems to be comprised of studded wood planks, with exterior stairs visible indicating multiple floors. Given this contruction it is not a barrack or dormitory and may be a military building. Photograph is dated in black ink to "194-" . Given the similarity of the setting and backdop to another dated image (DICEA2011-0001-0007), we can suggest a date of 1943 and the location of Fredericton Internment Camp. An identification card reading "73" is positioned on the ground beside the internee seated at the far right. The identification card used suggests it was a formal picture taken by a government official. Further the back of the image is stamped "47C" in the lower right corner in black ink. Barely visible in red ink is presumably the stamp for "CANADA INT-OP CENSORED". Verso: Stamps: "47C" and "T-OP SORED".